“Where I come from, there used to be a belief in the community that you shouldn’t educate girls,” says Catherine Mwangi who works as a Monitoring and Evaluation Officer with Concern Worldwide. Catherine is a co-investigator on the CeaSurge Operations Research project, supported by No Wasted Lives, that teaches mothers how to screen their children for malnutrition with the MUAC band to increase the number of referrals. In her native Kenya, she grew up in an environment where girls were told from primary school age that their destiny after school is to get married, and start a family. In her family, however, girls outnumber the boys, and her father told his children that there are no courses specifically for boys and specifically for girls, and encouraged Catherine and her siblings to pursue what they wanted. At high school, Catherine participated in academic symposia on topics such as biology and maths. She then went on to study actuarial science at the Jomo Kenyatta University of Agriculture and Technology, where most of her classmates were male. Catherine didn’t experience any different treatment from male colleagues or professors, but she was perceived as ‘tough’ for pursuing a mathematics course, and faced questions like ‘how did you even get here?’. She was determined to show everyone that women, too, can do these ‘hard courses’. 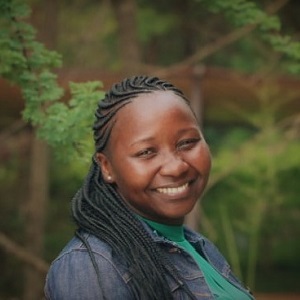 After graduating from her more classical science degree, and working in statistics for some time, Catherine decided to go back to education to study for a Master’s degree in Monitoring and Evaluation at the University of Nairobi, because it was her ambition to work in the humanitarian field. She has worked for Concern Worldwide for almost a year now, where she develops individual project monitoring and evaluation plans for programmes at field-level. In this position she carries out regular monitoring to ensure programme quality is achieved. Catherine hopes that more girls will take up science courses, and that parents encourage their children that nothing is limited to boys or girls. “In an emergency, women and girls are seen as vulnerable, but in normal life, it’s the mother who shoulders everything by helping her family to cope with difficulties. Women are always at the forefront”.